Linkody started as a simple backlink checking tool and has been continually evolving, getting more and more features as it did. And now it helps you earn backlinks from established sources, monitor these links, and analyze their metrics, among other great features. In this article, you and I will explore together all the features of Linkody, one by one. Oh, did I mention it has a very reasonable price? Or that they have a free backlink checking tool to get a sort of preview of what the SEO software does? It takes about a minute or two to go from signing up to monitoring backlinks, thanks to its simplified on-boarding process. In as little as four steps, you can start monitoring everyone’s backlinks. Once you’ve added your domain to Linkody, it will pull up a variety of essential metrics and display them in your dashboard for your ease. Additionally, you can also see your newly gained and lost backlinks, and those of your competitors’. You can expand most of these metrics by clicking on the view historical data link under each metric. This shows you how well your efforts have fared with your results. Coming back to the dashboard, you would scroll further down to see the latest statuses of your backlinks and a graphical summary. If backlink monitoring is the cherry on top, then the dashboard is the creamy exterior. It’s particularly useful for you SEO masters to be able to check up on the latest metrics of your own domain as well as that of your competitors’. That about sums it up for the dashboard. Next to the Dashboard tab, you’ll find the Links tab where you can view your backlinks. 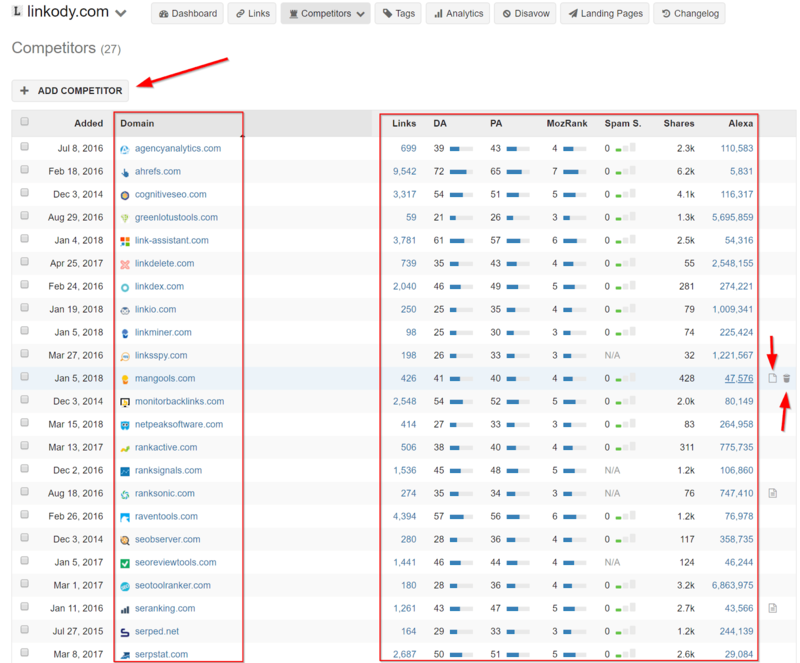 This shows a table with all the backlinks and their metrics. You may pull down the Columns option to select/unselect the metrics shown in the table. These are the different columns available to you. As with any good tool, you can sort and filter the backlinks to better analyze your backlink quality and quantity. You may sort the table based on a column by clicking on its header. Once you’ve gotten your table sorted and filtered to suit your needs, you can expand a backlink to get more details about that link. It shows it as an overlay dialog so that you can return to the page by clicking outside the box. With Linkody, you can go to the specific section and page of your link. This is probably the most useful and handiest feature of Linkody’s. 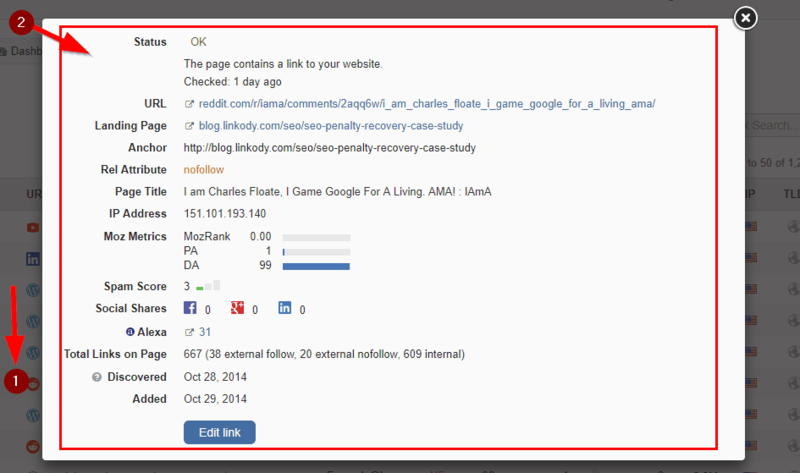 This lets you easily validate the links relevance to the page and section. Next up is the Competitors section, where you can see the Linkody magic happen. This section shows you what your competitors are up to such as their top pages and their backlinks. This is invaluable, as even someone starting backlinking for a website anew can quickly lift off the ground by seeing what your competitors are doing and imitating them. All the features of this section are detailed below. 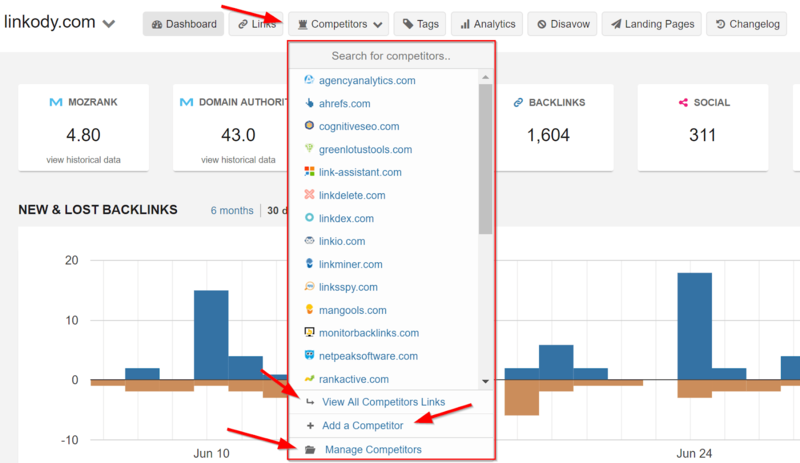 Select a competitor from the Competitors tab and view all their backlinks at once in a table. You can view the backlinks of each or all competitor’(s) backlinks, add new competitors, and monitor their metrics. Viewing top pages could be useful for a variety of reasons: to see which pages or content your competitors rank the highest for, the most and average number of backlinks a page has, which topics they’ve succeeded with and which ones were a downer, and topics they’ve omitted. You view the top pages by opening the View Top Pages link in the competitors section after you’ve selected a competitor. On a good day you can follow what they’ve done and do it a tad bit (three times) better to get the same kind of success. This is the feature you should use if you’re looking to creating content that will earn you backlinks. Or in other words, this is what one would call a linkbait content that’s a real link magnet. This type of content is very interesting and useful to a large set of audience that people will give you backlinks (without even asking them). In this quick yet detailed view, you can view all the necessary data on your competitors’ backlinks. You can view all your competitors’ backlinks; even 44k of them. Usually (or at least ideally) your competitors must be very similar to you in terms their niche and products/services. This is crucial so that you can be assured that you’re sailing in the downwind; thus, increasing the chances of webmasters featuring you as well. Now, just like with the Links section, you can sort, filter, and select your desired columns; experiment with the metrics Linkody offers. Search for “list” or “tools” – this is the best option to find the Ultimate List of XYZ tools. And if you check “not shared” link you will be able to find all the lists where our tool or service is not yet available (here are few more tricks you might like). As a matter of fact, your imagination is your only limit. So, you can try different combinations and perhaps even share some cool tricks you might find. 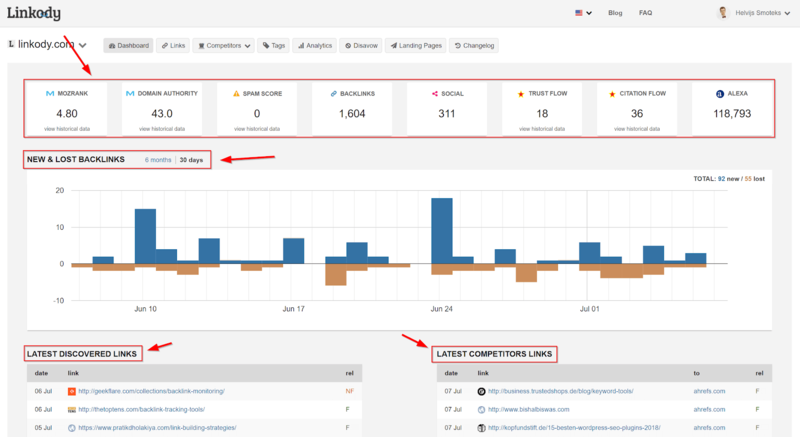 This part of the Competitors section is where you can manage and monitor your competitors’ attributes and other metrics such as their page authority or social media shares. This has everything you’d usually need. Sort and filter your competitors on their metrics to see which competitor is doing the best with growing links or having the most traffic (Alexa rank). Recently, another cool feature was added to Linkody where you can provide layered access control for different accounts. You can segregate and allow your partners’ accounts to view all or only some of your competitors. Besides the Links and Competitors page, there’s a specific section for backlink analysis. Here you can find a bunch of graphs of the metrics to get a quick (and detailed) overview of the metrics. You can also filter the data on the graphs using the different options provided in the filter dropdown menu such as statuses of backlinks like “OK”, “Errors”, “Paid” etc. There are few more cool things Linkody can do – but you have to unwrap that gift of a tool yourself. Otherwise, it’s no fun, right? Take the free trial for a spin and have some SEO fun. Afterward, let us know when was the point when you thought – “oh sh*t, this is pretty cool”. Would be great to know what surprised you the most about Linkody and its backlink skills. Powerful link building tool here Helvis. Incredibly in-depth resource too. Excellent review. Great review from your side about “Linkody” backlink tracker. 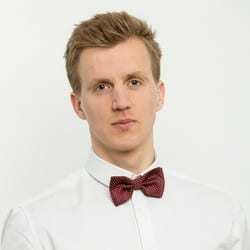 Linkody will help us in getting useful data of our competitor’s and by using those data, we can make better strategies to increase our website rank. It is always better to track our outcomes and efforts and this tool is going to be very helpful in doing the same.